The Mayans had it all wrong. The world did not go under, even if the lengthy interval since the last entry in this blog may have led you to think otherwise. 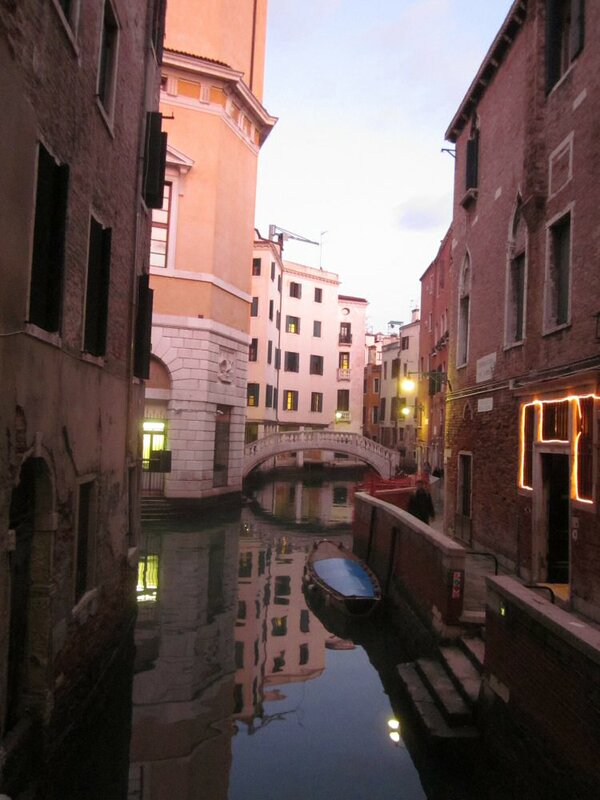 The absence of epic floods must have come as particular relief to the residents of my latest destination, for Venetians have enough of water all around them as it is. For centuries, this unique city has lived through highs and lows, and has withstood tidal waves of traders, invaders, and tourists. Every year, over four million of them roll in, and are channeled through Venice's maze of waterways, alleys, promenades and bridges. We arrived for a couple of days just after the new year had begun, in what is supposedly the very low season. Looking at the hordes present nonetheless, one dreads contemplating what peak season may look like. Fortunately, unlike water, tourists do not strive for an equilibrium. 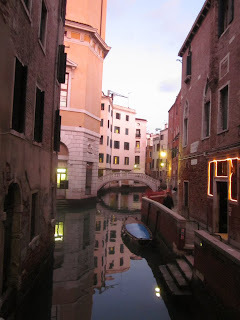 Adventurous as we were, we headed for the paths less trodden, and soon found ourselves away from the main drag in charming little side streets, peeking into opulent courtyards and watching nonne hang their laundry on lines across the canals. Every so often, we would pass a brightly painted chapel, church, cathedral, basilica or trattoria – places of worship each one of them. And whenever we felt the need for a little pick-me up, we indulged in this most Italian treat of all: The €1 caffè at the corner bar (Note to North American readers: This consists of approx. 3 oz. of super strong, freshly brewed, steaming hot espresso, without foam, cocoa powder, soy milk, caramel syrup or any other aberrations of the sort.) The effect is instant, and comes with a complimentary side of people watching. Which here, unlike at the Las Vegas imitation, is a joy all by itself. Perhaps following the same advice to visit during the winter months, a refreshing number of domestic Italian visitors populated the city. And they brought with them the impeccable fashion, and casual cool attitude, that is so typical of this magnificent people. From teenagers with their bomber jackets and gelled hair, to signore in fur and heels, to elderly gentlemen with their bright yellow cashmere sweaters and corduroy pants, they all oozed style from behind their oversized sunglasses. If you were born north of the alps (or, god forbid, west of the Atlantic), you will find the spectacle by the lagoon both mesmerizing and frustrating, for you will simply not stand a chance. All this humiliation is made only a bit more palatable by the fact that Italians are, well, Italians: Wink at a passing signorina, and she will acknowledge your adoration with a smile – before hopping on the next vaporetto. As the sun sets and the rising mist shrouds the city in mystical twilight, it is reassuring to see how Venice has withstood water and visitors for another day. Over a glass of white wine on the lagoon, I take confidence in the year ahead. It may not be a gondola ride, but at the end of the storm, there is always calm. Grazie, serenissima!